The Rebel Sweetheart. 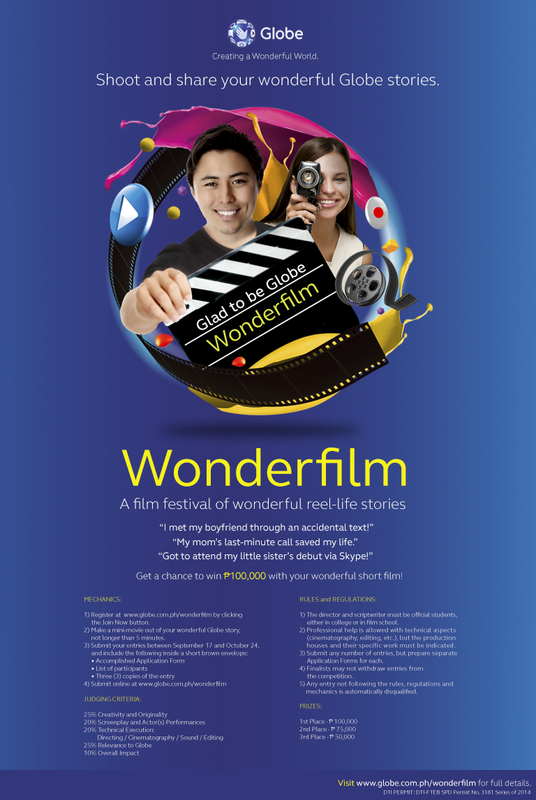 : Be part of Globe's Wonderfilm! Calling all aspiring filmmakers! Globe wants you to shoot and share your wonderful stories for a chance to win Php100,000! Making someone smile because of a text. Sending that tuition fee payment on time thru your mobile phone. Planning your gang's next trip on group chat. Hearing your baby talk for the first time, even if you're abroad. We all have wonderful days using Globe, may it be through small acts or memorable milestones. I'm sure you have your own wonderful Globe story, too. Why not share it to the world? Turn it into a five-minute video and you might just win Php100,000! If you're a college undergraduate or a film student, you can submit your entries from September 17 to October 24, 2014. Fill out an application online or download the form and send it together with your video/s. Selection of winners will be on October 28, 2014, while the announcement of winners will be on November 7, 2014. For more information, and to view the full mechanics, visit Globe's official website. This sounds like a great opportunity! Thanks for sharing! What a great way for students to earn money. Is this just for the Philippines? I've never heard of this but it sounds really interesting! I'll have to pass this along. This sounds like a great opportunity for a potential film student. Thank you for sharing. That sounds like an awesome opportunity. I will be sharing this. What a great opportunity! Is this just for the Phillipines? I didn't know about this! Sounds amazing! I love this idea. I am going to have to share with my son because he gets into this kind of stuff. He can enter and maybe win. Thanks for sharing. Globe's wonderfilm is really a fun & great idea. I am sure that everyone have their own college day memories, that are sweet & cute. Sharing our sweet memories is truly a pleasant thing. A great concept indeed. this is really cool. good luck to whoever wins. This is a great idea! thanks for sharing !! !